It's ironic, since Eddie was talking about American remakes of British films, and the cultish pulp monster Event Horizon is a British "of Hell!" to a Russian "Room With a View". When you're gonna steal iconic images: steal from the best! Solaris. Why did we ever like this silly, disgusting gross-fest that inadvertently lampoons far superior entries into the whole mystery and terror of space subgenre? We think much of it has to do with its high levels of Sam Neilliness - Sam Neill sweating into his bedsheets! Sam Neill floating in a classy spacesuit! Sam Neill losing his shirt! - or does it go the other way around? Do we worship at the altar of Sam Neill because of this terrible film? It was on television an awful lot back in the 90s. 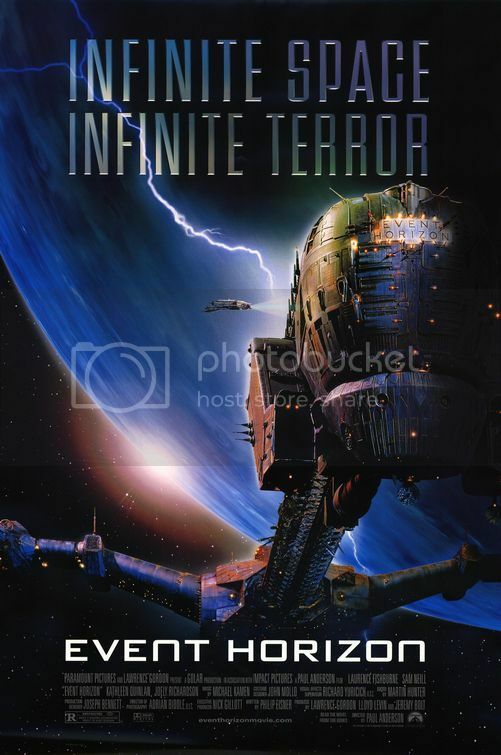 In 2040, Earth launched its first deep space vessel, the Event Horizon, a ship that was supposed to achieve faster-than-light travel using nifty space-bending stuff (Sam Neill thought of that, Simon Pegg didn't!). Instead, it never got past Neptune, where it just went dead in the water, lilting lazily to the side. Now, seven years later, a team of scrappy, reluctant pseudo-military types, led by man o' the people Captain Morpheus (Laurence Fishburne) and frosty intellectual Doctor Awkward (Sam Neill! ), go for the rescue mission. For long flights, such as those over the Pacific. The best, most visually fun sequence in the film. The rescuers do find the Event Horizon, and when they do, plasmic hell goo (literally) starts splashing everywhere, quickly followed by blood, guts and sanity. In an early scene, the laddish military types are resentful to brainy Sam Neill for dragging them into this mess - and their anti-intellectual sulking is later justified: yes, it really all was Sam Neill's fault. Of course, in an early scene, likable tech officer Peters (a youthful Kathleen Quinlan) also likens a former crewmate to a "corpsicle" - and that pretty much sets the tone of this film. With utter seriousness, a sort of ultra-grim melody supplied by overachieving eyebrows, frosty irises and moody intonations, this film wallows in the most ludicrous scenarios. It seems to have no self-awareness at all; it doesn't realize how over-the-top it is. Instead, it goes for A-grade horror - something it only intermittently achieves, such as the glorious sequence in the green vent - when it should really be basking in B-grade silliness. On paper this is the stuff of Ghostbusters, but - alas - when choosing the form of their destructor, they went for eyeless dead wives instead of a giant marshmallow man. What is the purpose of long spikes in the engine room? Just, you know, wondering. So should it be watched? Only at your own peril! We kind of perversely enjoyed watching it in groups when it would be on TV, if only so we could crow at Sam Neill and then make big noises of shock when the bloody stuff begins. But it's not a particularly good film, so we can't really recommend it. It seems much more intent on pushing the boundaries of gore and dressing these up in some visual references to better films, instead of, you know, investing some more thought into the plot. On Smash - Alas, I used to too!